Following the workshops, held earlier in November, the issue of copyright was raised, and specifically how it relates to conceptual figures. Having looked into the subject, so far only via the internet, Gill has discovered that copyright for these figures is a complicated, and somewhat grey, area. Although there is still a lot of investigation to be done into this topic, it is worth highlighting some of the issues at this stage. One look through Google image shows that a lot of figures are copied or re-used, again and again, particularly if they are well-drawn, or comprehensively informative figures. This can almost certainly be attributed to the fact that scientists are lacking either the time, the skills or the software to produce their own figures. Sometimes the figures have been re-drawn but they may also be re-used in their original form. This may well be with the permission of the originator of the figure but, as Dr Robert Thorne pointed out (in this blog post) figures are often used without permission or acknowledgement, prompting Dr Thorne to include his initials on all of his original figures. Once a figure is on the internet, via any means, then it will almost inevitably be copied or re-used, and the copy will then also find its way onto the web. It is impossible to stop this from happening, as use of the internet for online publishing, teaching and general communication between scientists is essential. Repeated re-use can make it difficult to trace the originator of a particular figure, and could be the reason that some people do not even try to find out. That may also make it difficult to vouch for the accuracy of a figure. In the case of this figure on the neurographical instagram feed, it became apparent to the originator that the figure was anatomically incorrect after if had been published, but by that stage it had already been re-used by other scientists. The story of this figure is told in the review of stage 3 of workshop 1. Once a figure is out on the internet, and particularly if it has then been re-used by others, it is impossible to retrieve it. While Google image can be a godsend for a scientist quickly looking for a figure to illustrate their presentation, it can also be a minefield. When it comes to producing figures for use in published papers, as opposed to an internal presentation, then attention must be paid to copyright issues. However, when a figure breaches copyright is not always easy to define. A straightforward re-use of a figure, or a direct copy, would obviously fall foul of copyright. However, if the figure has been ‘significantly’ re-drawn or ‘substantially’ adapted, then it would escape censure. How the terms significantly and substantially should be defined is not clear, and results in a significant and substantial grey area. Take the images that Gill produced for the workshop 1 stage 1 activity, as an example. All of the images were drawn from scratch but all used either an anatomical photograph or existing figure(s) as a reference. Basing a line drawing on a photograph, and then adapting that drawing, would surely not infringe the copyright of the original photograph. However, producing a line drawing from an original drawn figure, even with some editing and modification, would have to be considered in terms of its possible infringement of the copyright of the reference image. Presumably almost all drawn images use some kind of reference, or several references in the case of some of the activity images, and are not drawn completely from the imagination. How much difference does there need to be before copyright is not an issue? How much time do scientists spend introducing deliberate differences into what would otherwise be a perfectly adequate figure, just to avoid copyright infringement? As has been discussed before, in this blog post, conceptual figures typically contain certain visual elements that are recognisable due primarily to their shape, with colour rarely being significant in terms of meaning. 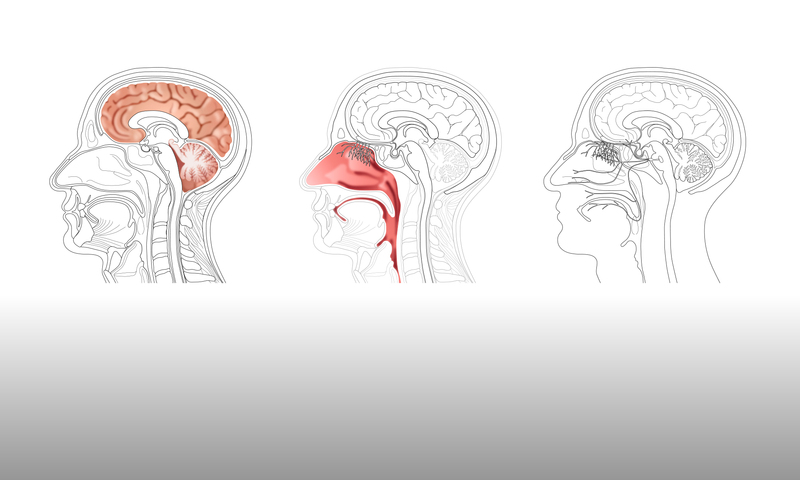 The header image of this blog post shows three representations of the hypothalamus, pituitary and hypothalamic nuclei that are very similar in their portrayal of these elements. Therefore, making a conceptual figure significantly different from other figures that are incorporating the same visual elements can be difficult. The resulting figures are all ‘variations on a theme’, with slight differences in shape. There is, however, often significant difference in colour, which can be used to differentiate a figure. The more anatomical a visual element, the more likely it is that representations of it will look similar – a mid-sagittal section through a human brain appears much the same however it is drawn. Visual elements such as the hypothalamic nuclei, which are rarely represented anatomically, show a much broader range in their appearance and can therefore be used as a point of differentiation between figures. As the vast majority of conceptual figures are to be used for non-commercial, research purposes, most originators will give permission for their figures to be used, provided they are credited with producing the figure in the first place. Once a figure has been published, copyright passes to the publisher, and gaining permission to use a figure can be a bureaucratic and time-consuming business. When using a figure that will be published in a journal or book, permission must be sought. In less formal situations, such as a presentation where the figure will be shown digitally but not reproduced on paper, then this may be considered as fair use of the figure, without the need for formal copyright permissions. In any one research area, the conceptual figures being used are often showing exactly the same process. For example, for the papers that Nisha and Yannis are producing the figures will represent the possible pathways for molecules to take from the nasal cavity to the brain. Many papers have been published on this topic and the conceptual figures used in these papers show essentially the same thing, although visualised slightly differently to avoid copyright issues. To Gill, looking from the outside of this peer group, it seems strange that a figure depicting a well-known process should be copyrighted. As open source publishing in science becomes an increasingly important topic, perhaps allowing open access to conceptual figures should also be part of the discussion. Gill intends to produce a document to clarify the subject of copyright as it applies to images within the CNS image gallery. Ideally, none of the images should have any copyright restrictions for use by members of the department, but this has to be confirmed. Each image should have its own ‘copyright label’, describing exactly how the image may be used. Looking ahead, creating a consistent visual style for the department, and encouraging members to further edit and adapt the images for their own figures, should both remove the likelihood of infringing copyright and make all figures produced by the department easier to recognise and so easier to trace back.